B is 41 months Z is 11.5 months It is our second week of returning to organized tot trays or what I now refer to as tot school along with 1+1+1=1 blog. 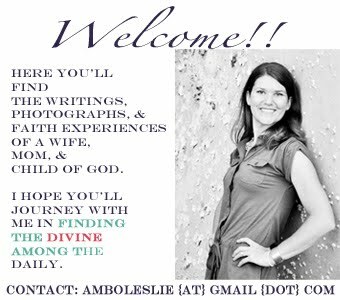 I have primarily decided to share these on my blog, because I have found other blogs who share their ideas extremely helpful and motivating. If you want to read a little more about how I set up my bins it can be found in my first Tot School post. Exploring Bin- I filled the exploring bin this week with smooth rocks and small neon textured balls (both purchased at the Dollar Tree). I added our plastic penguin s, nesting barrels , stacking cups , tweezers, and a few other empty containers. This was one of B's favorite sensory bins to date. He love the neon textured balls. He refers to them as, "nature sauts!" I have no idea what that means or where it came from, but he had a blast with them. Zoe wanted to get in on the action too. No, I would not recommend this activity for children her age. However, anytime she is playing with something small I sit and watch her. It was totally worth the few rocks I had to remove from her mouth, because she thoroughly enjoyed herself. B usually plays with these bins when she is sleeping, but he asked to play with it in the afternoon and I said yes deciding I would watch her closely. 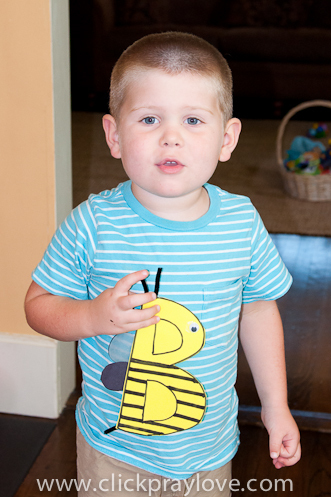 Alphabet Bin- Last week we focused on the letter B making the bee craft from Totally Tots. 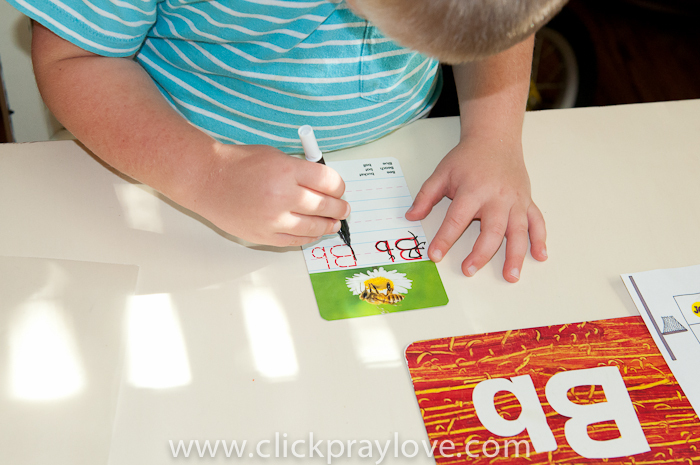 He traced the upper and lower case B on his alphabet dry erase cards (which I found for $1 at Target) and we read What If There Were No Bees? 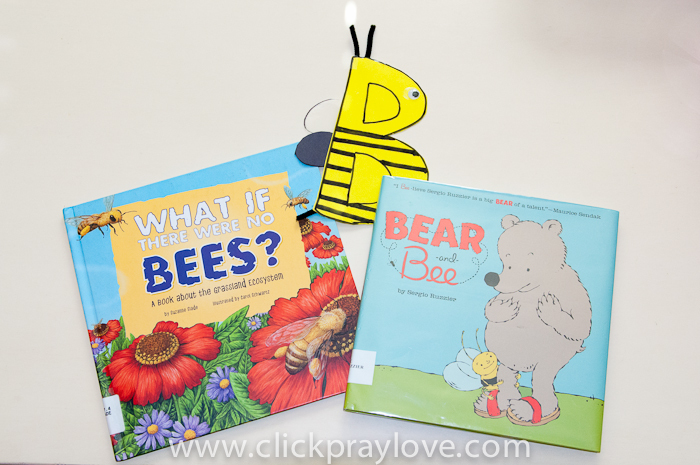 and Bear and Bee which we checked out from the library. I would recommend both of the books seen below. What If There Were No Bees is a book about how our world would change if there were no bees. The illustrations are great and the text is simply enough and help a young child understand the importance of bees in our ecosystem. Bear and Bee has a very sweet story line. The bear has never seen a bee, so he is clueless that he is talking to a bee. He assumes bees are big and scary, but the bee convinces him otherwise. B really enjoyed this book and asked me to read it several times. Manipulatives Bin- I found this counting puzzle at the Dollar Tree that went perfectly with our B week and our bee books. 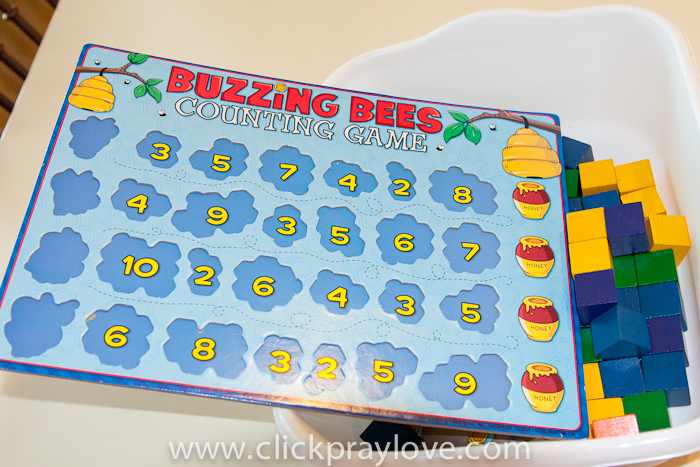 The puzzle required B to count the honeycombs to figure out where it fit on the puzzle board. 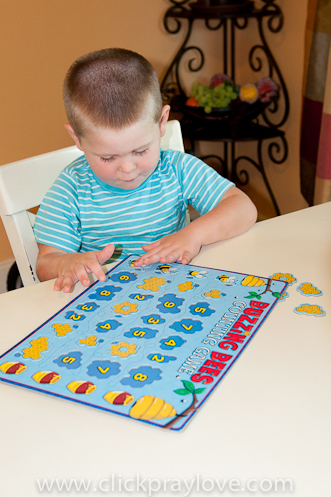 The puzzle was a little difficult for him, because the pieces had to be turned multiple times before they would fit. We then used our Wood Counting Cubes to build towers on each number. B really enjoys the wood counting cubes. We have been using them a lot for counting. 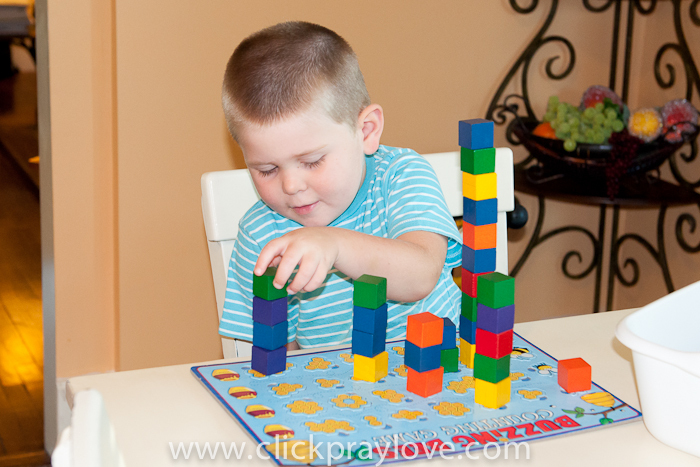 Later in the week I switched to a Counting Floor Puzzle which he really enjoys, but we still made towers with our counting cubes on each number. 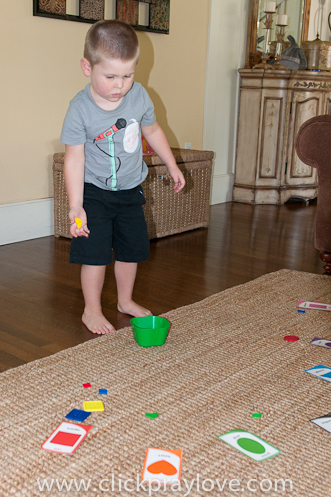 Free Bin- I filled the bin with various shaped buttons and and spread flashcards with matching shapes on the floor. Directions were to throw the shaped button to the matching shape card. 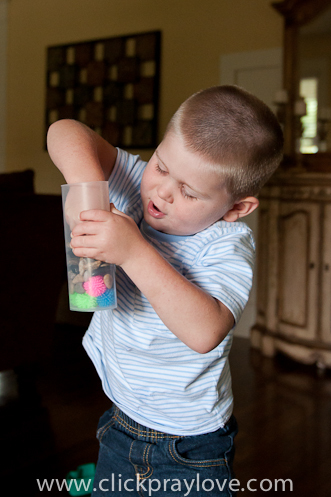 B does not naturally gravitate toward throwing activities, so this was a good way to incorporate the activity. 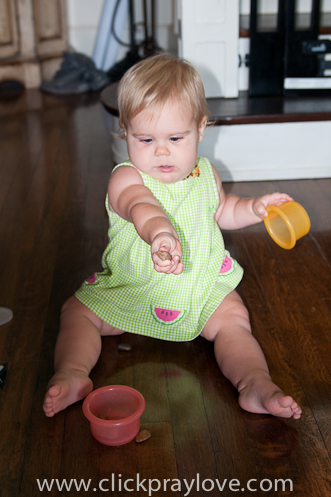 I gave Zoe a box filled with various plastic lids that B used for Flip Top Lid Fun when he was about 18 months old. She enjoyed herself, but is much more interested in doing what B is doing. You have a teacher's heart! :) Love seeing the kids learn with you.